Thursday night in Waunakee brought together some of the best young talent in the Madison area including Madison Memorial's very own freshmen and sophomore classes. It is always fun to see this young group of kids come together as a team and perform to such high abilities. As coaches we get excited about thinking what the future could hold for this group. 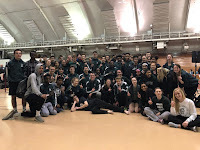 As always we know that this can only be accomplished through hard work and dedication to the sport of track and field and the classroom over the coming years. Christina M won the discus with a throw of 83' 5", Mariah O-F won the 300m hurdles with time of 52.0, Phibi M won the 100m hurdles with a time of 17.7, and Claire F. finished third in the shot put with a distance of 27' 2". Additionally, the boys 4x100m relay won in a time of 46.0, Ryan B. won the discus with a throw of 119' 9", Quincy M took second in the 110m hurdles in a time of 17.3, Kaayvon G-H took third in the 400m dash in a time of 54.5, Sam B. took third in the 1600m run in a time of 4:51.24, Jeremy G took third in the discus with a throw of 109' 9", and Eligh A took third in the long jump with a leap of 17' 10". There were many PR's accomplished at Thursday nights meet. It is important that all of these athletes take full advantage of the coming weeks to finish their season with their best performances. Getting plenty of rest, drinking lots of water/fluids, and eating healthier over the coming days will help ensure this process. The best way to enjoy the end of the season is to make sure you are performing at your best.